ODESSA, Ukraine -- At first sight it seemed an improbable appointment: a man who had served twice as president of neighbouring Georgia, parachuted in as governor of a single region of Ukraine. In the first extract of an exclusive two-part interview, former Georgia president Mikheil Saakashvili – now governor of Odessa – reveals why he believes Putin is such a serious threat. And not just to Ukraine. But for the government in Kiev, beset in the east by pro-Russian rebels, and facing entrenched corruption and an array of powerful oligarchs elsewhere, it was an obvious choice. He has embarked on a string of dramatic reforms on whose success, he believes, the future of the region, with its large Russian speaking and perhaps Moscow leaning minority, depends. And he will be reminding anyone who will listen that among the greatest threats, not just to Ukraine but to a wide swathe of eastern Europe, is the Russian president, Vladmir Putin. “I predicted that Ukraine would be next in 2008, and that the Baltics would be next,” he said. He believes his prescience at that time means that people should pay attention to what he thinks now. He made an immediate impression within days of his appointment. He was seen publicly haranguing local prosecutors for running “racketeering schemes” against local businessmen; the video of this performance was watched by millions. Later, he took aim at air regulators, declaring a new open skies policy above Odessa. “Oligarchs can have their airlines, but they can’t expect me to let them have a monopoly,” he said. Few missed the thinly veiled reference to Igor Kolomoisky, rival and major shareholder in the national flag carrier, Ukraine International, and leading player in the Odessa port. He says he is not afraid of threats against him personally. “I am the only person still walking who Putin has menaced to kill,” he said, speaking in English. But he does believe that the Baltic states – Lithuania, Latvia and Estonia, all of which, like Georgia and Ukraine, were once part of the Soviet Union – should increase their defences urgently. Tensions in Odessa were running high after 42 mostly pro-Russian demonstrators were burned to death when a trades union building was set on fire in May last year – an incident that some feared might be used as a pretext by Russia to step in, much as it had when it seized Crimea. Saakashvili has promised further investigations into what happened, and to establish a permanent memorial to those who died. But his main strategy for making Odessa more secure against any threat from Russia is his drive to eliminate corruption and Odessa’s pervasive mafia – much as he did in Gerogia. While he was president, the country rose to eighth place in ease of doing business indices and his economic achievements were coined the “Georgian miracle” by supporters. He believes that Putin is nervous about the ideas presented by his Odessa experiment. “Changing the fundamental economics in a Russian-speaking region gives us a chance to kill corruption and undermine the whole of the Putin story,” he said. He has no doubt about who his enemies are. Who are Putin’s closest allies? “I would say corrupt officials. Corrupt officials in Ukraine are naturally anti-Western. Usually when you talk to corrupt policemen or customs officers, they are very angry about Americans and they are naturally soft on the Russians. The faded resort and port city of Odessa has certainly seen better days. But the energy and direction he and his team of sharp-suited advisers are bringing have led many to believe that the whole of Ukraine’s faltering reform programme might just be jump-started here. And following initial bewilderment at the appointment, many Odessa residents and foreign investors have begun to hope in the new governor. “He’s over the top”, says American investor Theadeus Worlff. Saakashvili seems happy to fulfil that role. “Putin doesn’t like me or people like me,” he said. Under his watch in Georgia, he says, there were “many times less criminality than in Russia” and it was the least corrupt country in the region. In November last year, when residents of the disputed east of Ukraine voted in favour of a pro-Russian leader, the poll was widely denounced as a “farce”. There was, however, one region to recognise the result – breakaway South Ossetia, on the Russian border with Georgia. Mikheil Saakashvili, enemy of Vladimir Putin who did much to implant democracy in Georgia, left the country in June, claiming he faced “guaranteed imprisonment”. 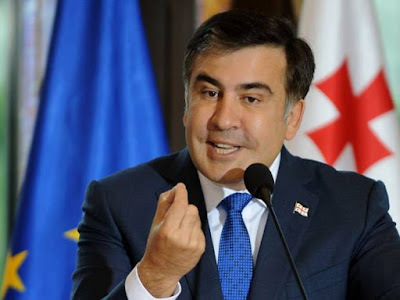 Mr Saakashvili, who has been accused of abuses of power, was given sanctuary by Ukraine’s President Petro Poroshenko, who in turn appointed him governor of Odessa. Georgia says Russian forces in South Ossetia have pushed the de facto border nearly half a mile into its territory. UN Secretary General Ban Ki-moon has said he is “concerned” about recent activity in South Ossetia.